PSA is the world’s largest systems integrator consortium, owned by some of the most progressive systems integrators throughout North America. For over 40 years, PSA’s mission has been to empower its owners to become the most successful systems integrators in the markets they serve. We bring this mission to life by partnering with industry leading product and solution providers, delivering unparalleled education and training programs and by offering a variety of distinctive services that can enhance any company’s operations. 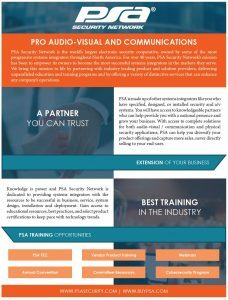 PSA offers a wide selection of over 160 security and audio-visual product lines from the industry’s leading solution providers. Let us do all of the negotiations and maintain pricing for you. With volume purchasing discounts and low overhead, those savings get passed on to you. Find out which level of participation is right for you. Learn more about what you will gain by joining PSA Security Network. Interested in buying from PSA? Get in touch to find out more.